Want to improve your classic rock guitar playing, but don’t know how? You are not alone. Many guitarists learn the pentatonic scale and dozens of licks but struggle to play (or improvise) cool classic rock guitar solos. Some weaknesses simply require more practice to be corrected. Other weaknesses develop from neglecting certain skills and not realizing their importance. These gaps in your musical abilities hold back your classic rock guitar playing and make you frustrated. You must identify all the skills needed to play classic rock guitar well and learn how to apply them, so your playing sounds awesome and you feel like a rock star when you play for other people. You can apply virtually every musical skill in classic rock and blues...even skills most musicians typically think are only for "metal" or "hard rock" styles. Common example: sweep picking arpeggios. Most classic rock guitar players do not use arpeggios in their music because they don't know how to fluently integrate arpeggios into their music without sounding out of place. This limitation puts unnecessary restrictions on your creativity as a musician. Note: Practicing raw skills in isolation is not enough. You must also integrate (combine) your skills together in creative ways. Integration is a key element of musical mastery in any style (more on this below). Guitar Technique - Technique is general physical ability to play whatever you want to play on guitar. You need a high enough level of guitar technique to play your music effortlessly, accurately and feel great every time you pick up your guitar. Most famous classic rock guitar players do not play super fast, but they developed enough technique to perform their music consistently well. Tip: your maximum level of guitar technique must be slightly higher than the level you need to use in real life (such as when performing or recording your guitar playing). This makes your guitar playing consistent and reliable. Guitar Phrasing - this skill allows you to play guitar with emotion. Phrasing refers to playing every note in your guitar licks and solos as expressively as you can. The better your phrasing, the more emotion and feeling you can put into your lead guitar playing. Every note you play must be phrased in the most emotional way possible. No note should be taken for granted (whether you play slow or fast). Lead guitar phrasing is the single most important skill you can develop as a guitar player. This guide shows you how to play lead guitar with feeling. in your rock guitar improvisations. Learn how to play cool guitar solo ideas by avoiding commom errors. guitar licks from only a few notes. This article explains how to practice ear training the right way. Note: Many guitar players (especially those who play classic rock) confuse understanding music theory with learning to read music. The two concepts are not at all the same. You can understand music theory without reading music (and vice versa). Reading music doesn't help your classic rock guitar playing. Understanding music theory does. The amount of music theory needed to play classic rock well is usually less than the theory needs of other musical styles. That said, you must understand the fundamentals of music theory no matter what style you play. Fretboard Visualization With Scales, Chords And Intervals - this skill helps you play guitar solos and licks all over the fretboard, without becoming lost or playing out of key. 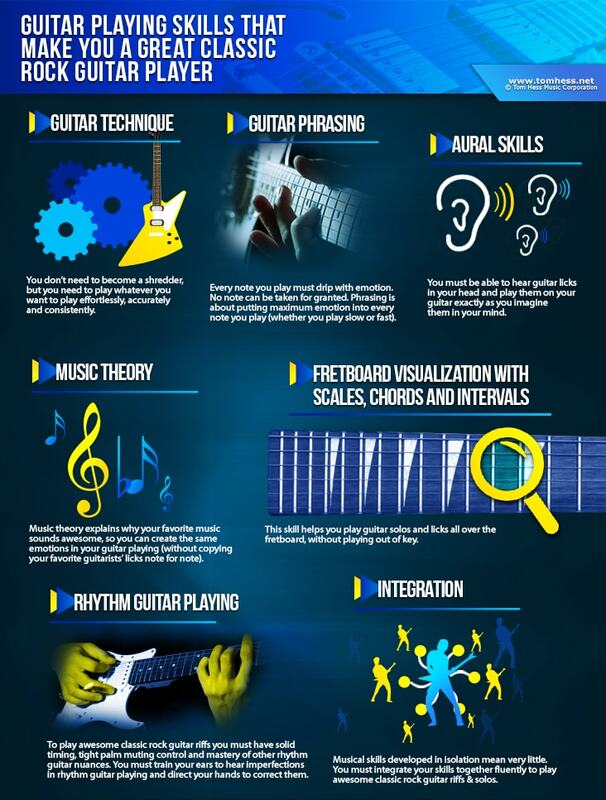 Fretboard visualization mastery is about seeing the guitar neck the same way a piano player sees the piano keyboard. Pianists can play any scale or arpeggio in any part of the piano fluently and without hesitation. They don’t think in terms of scale shapes or arpeggio shapes. You need the same level of mastery over any scale you play on guitar. Rhythm Guitar Playing - Playing awesome classic rock guitar riffs is about having solid timing and tight palm muting control. You must train your ears to hear imperfections in rhythm guitar playing and direct your hands to correct them. Integration - musical skills developed in isolation mean very little. You must integrate your skills together fluently to play awesome classic rock guitar riffs & solos. You now know what it takes to play awesome classic rock guitar solos like your favorite guitarists. 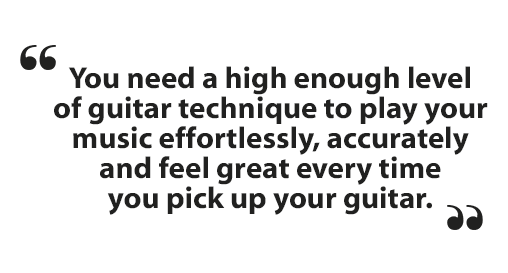 Your next step is to learn how to master these skills quickly, so you become a guitar playing badass and impress your friends with your awesome playing and rapid progress. Begin the process right now by working with me in my online guitar lessons and learn to play guitar the way you’ve always dreamed about.